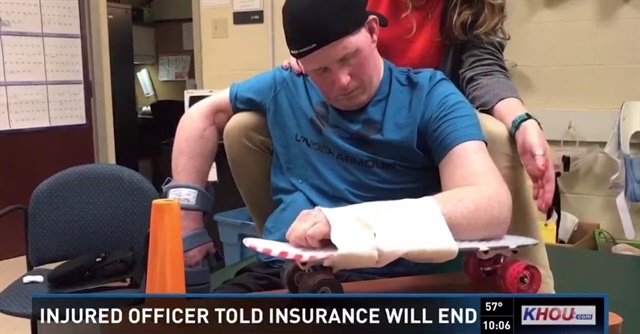 VIDEO: Insurance Coverage Ending for Deputy Rehabbing from Critical Wounds in 2016 Baton Rouge Ambush"
An East Baton Rouge, LA, deputy shot and nearly killed in the line of duty in 2016 may be forced to leave his rehabilitation center by his insurance company. Nick Tullier, 41, moved his left arm, mostly by himself, 15 times during rehab Wednesday. However, those praying for his full recovery worry about his next step. Last July, a gunman killed three police officers during an ambush in Baton Rouge. Tullier survived despite being shot in the head, shoulder and abdomen. His father James Tullier said doctors initially gave Tullier 24 hours to live. Then, therapists at Houston’s TIRR Memorial Herman rehabilitation hospital took over. Tullier got strong, but not as fast as some people wanted, according to family. KHOU 11 News called HealthSCOPE, the company in charge of paying Tullier’s claims. On the phone, a spokesman said they are not an insurance company and cannot speak specifically on Tullier’s case. However, they shifted blame to a third-party medical management group called American Health Holding. On Thursday, a HealthSCOPE spokesman told KHOU 11 News responsibility lies with Hines and Associates company, which contracts with the East Baton Rouge Sheriff’s Office and that American Health Holding is not involved.